Andi's challenge thus far has been more about mere accomplishment, though. It's redefining how I think about my reading entirely. By prioritizing reading my own damn books as much as those with deadlines looming, I've learned that a) I actually do have the time to fit it all in, if b) I make the time. And c) I bought all these books for a reason, and d) that thus far, my reasoning has proved fairly sound, and that e) I like reading books that aren't assigned to me and f) I won't always (ever?) write about them and that's ok. The two forms of reading are starting to occupy different slots in my days, and I'm finally admitting to myself that they occupy different spaces in my brain... and I'm cool with all of that. 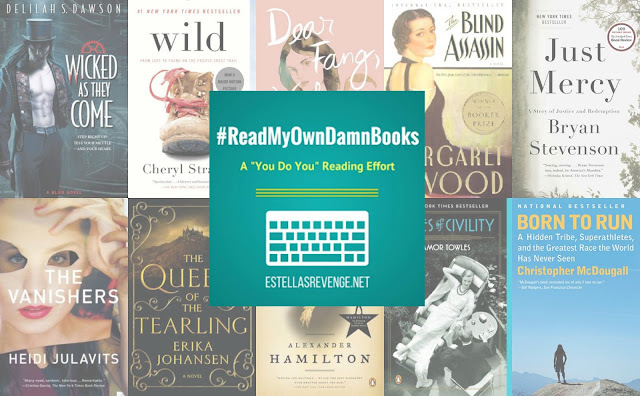 So here's to reading our own damn books! Are you participating in Andi's challenge? Or do you in some other way focus on reading the books you buy? Or are you one of those mythical unicorns who does not fill all available nooks and crannies of a house with unread books?